Bridging the gap between academia and industry to turn the ideas of the country’s brightest minds into successful commercial projects is one of the challenges struggled with by innovations institutions all over the world. 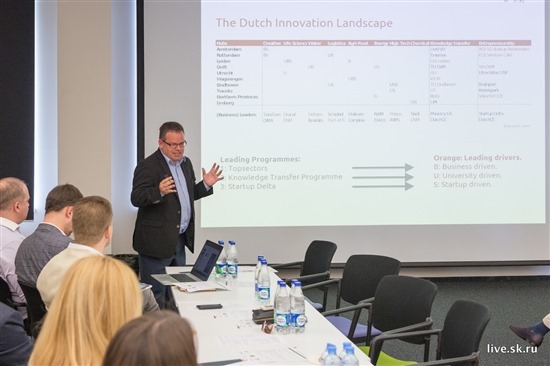 To find out more about the Dutch approach to this mission, the Skolkovo Foundation on Wednesday hosted a roundtable for representatives of Dutch and Russian universities, innovation hubs, industrial partners and government bodies. Representatives of Dutch and Russian universities, industry and government swapped ideas at the event. Photo: Sk.ru. Professor Hein Roelfsema of the University of Utrecht explained the key role of the Netherlands’ universities in the country’s innovations ecosystem, which he said had grown up as a result of the 2007 financial crisis. Now the country has a network of 10 innovations hubs, all of which are connected to major research-driven universities, he explained. The universities of Amsterdam, Utrecht and Maastricht were represented at the event, along with the Rotterdam Centre of Entrepreneurship and Dutch tech giant Philips. 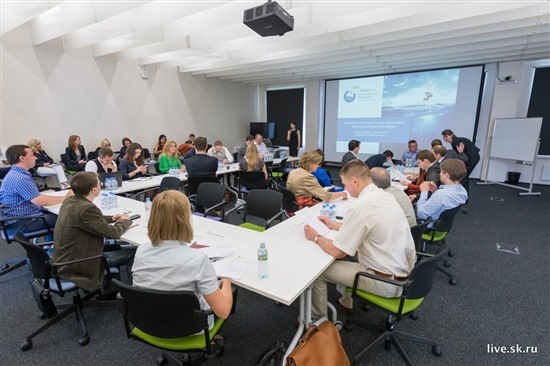 The Skolkovo Institute of Science and Technology (Skoltech), the private graduate research university attached to the Skolkovo Foundation, has its own centre for entrepreneurship to support translational research – fundamental research that can be applied in practice. In addition, students are actively encouraged to form their own startups. But that approach is a new one in Russia, where many universities do not necessarily see promoting entrepreneurship as something that falls within their remit. To help university representatives forge useful contacts and exchange ideas on how to commercialise research, the event included a “speed-dating” section in which participants could briefly introduce themselves and exchange contacts before moving on to the next person every time a bell was rung. The Russian institutions present included Moscow State University (MSU), the Higher School of Economics, Moscow State Medical University, Moscow State Institute of International Relations (MGIMO), the Urals Federal University and the ITMO technical university in St. Petersburg, as well as Open University Skolkovo and Skoltech, which hosted the roundtable. Professor Hein Roelfsema presents the Dutch innovations landscape. Photo: Sk.ru. Dmitry Nechaev, a professor at MSU, said the speed dating format had been efficient in helping people get to know how they could help each other. Now that introductions have been made, the practical plan is to set up a virtual network on academic entrepreneurship as a follow-up to the event, said Pauline Döll, attache for innovations, technology and science at the embassy of the Netherlands in Moscow, one of the organisers of the event. “We want to use this network to start working,” she said. Professor Nick Guldemond, a specialist in e-health at the University of Utrecht and a regular visitor to Moscow, believes there are a lot of opportunities for collaboration between Russia and the Netherlands. “It would be interesting if we could connect our ecosystems, and learn how to collaborate within these networks,” he told Sk.ru.